Dancer, painter, writer, muse, passionate lover, and freethinker, Zelda Fitzgerald is one of the most iconic figures of the Jazz Age. Born in Alabama in 1900, she was only 18 when she met F. Scott Fitzgerald, an ambitious young writer who would turn into one the greatest American authors of all time. Beautiful, talented, irreverent, extravagant, and alcohol-driven, the newly married couple took New York’s high society and the whole literary world by storm. They traveled to France, Italy, and Africa; hung out with Ernest Hemingway, Dorothy Parker, and Gertrude Stein; managed to both charm and enrage most of the people they were acquainted with; and ended up destroying their love and themselves—Zelda was diagnosed with schizophrenia and spent more than a decade in psychiatric clinics, tragically dying at 48 in a fire. Superzelda is a thoroughly researched work based on period photographs and documents, as well as on Zelda and Scott’s writing. It is a biography, a love story, and a travelogue all wrapped into one. The beautiful two-color illustrations bring to life one of the most fascinating women, as well as eras, of the early 20th century. Daniele Marotta was born in Orbetello, Italy, in 1972. He is a cartoonist and a scholar of visual communications and pop culture. He is also the author of Conan & Frodo (Simonelli Editore, 2007). Together, since 2008, Tiziana and Daniele have been creating illustrated book reviews for D, the weekly magazine of La Repubblica. 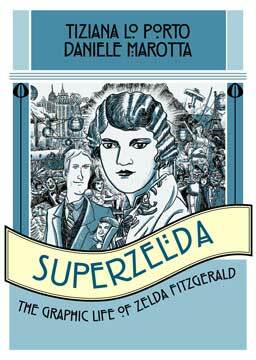 Superzelda is their first graphic novel.